This recipe will get you in the holiday spirit but you can totally replace the cranberries for something else and make this any time of year! I love adding the SuperBeets Collagen to these because beets have so many healthy benefits including helping to support a healthy cardiovascular system. And collagen is essential for helping to support things like healthy skin. The texture of these is more “cakey” like a traditional scone (less crumbly) but they’re a delicious breakfast or tea time snack regardless! These are paleo-friendly, dairy-free, gluten-free, grain-free and refined-sugar free. – Mix all ingredients except dried cranberries until a dough is formed. – Prepare a baking sheet with parchment paper and spray with coconut oil so your scones don’t stick. – Take the dough and form it into a ball then press out until it is about 1-1.5 inches thick on the parchment lined baking sheet. If your dough is too sticky you can refrigerate it for 30 minutes before the ball step. – Cut into 6 even triangles. – Bake for 18-20 minutes until the edges are golden and firm to touch. For health tips and recipe inspiration: Follow Charlotte on Instagram @press.startnutrition and visit her website www.press-startnutrition.com. 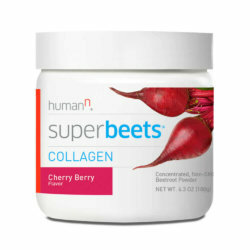 The latest addition to the SuperBeets® family, SuperBeets® Collagen mixes our premium beets with collagen peptides to help support healthy skin. A keto-friendly combination in a brand new cherry berry flavor.